took a traumatic brain injury to slow me down. When I finally took the time to heal, I did something new: I drew. The result is what you see; I’ve turned my thoughts and feelings into art. To uplift• to affirm• to heal• to delight. To wear• to send• to hang• to share. I hope that, like me, you too can learn to slow down, enjoy the moment and Just Bee. Anyone who knows Lori Mertz knows she has always moved fast. Whether she was working production for television and film projects or nurturing the three foster kids she took in when she was 29. In 2001, she was moving so fast, she went over the handlebars of a bicycle on PCH in Newport Beach and sustained a life- changing traumatic brain injury. In the years that followed, the healing process compelled her to slow down. In the quiet of her new life, Lori felt an urge to do something she had never done before the accident – to sit and draw. As she sat she began to fill notebooks with beautiful ink-on-paper sketches incorporating uplifting words into distinctive, curving, geometrical designs. 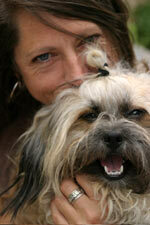 Each of Lori’s works conveys a bright, effusive, life-affirming spirit. "It was/is a living journal to my former foster children. What I wanted them to know about me: what I thought, how I felt, what I believed." For years she kept her art to herself. Then one day a friend caught a glimpse of Lori’s work and encouraged her to share her unique vision with others. Taking this encouragement to heart, Lori turned her designs into greeting cards, full-size wall art and apparel for infants, toddlers and women. The result is JUST BEE. 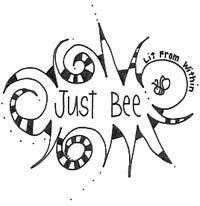 JUST BEE is both Lori’s company name and her new life philosophy. It is inspired by two of her favorite creatures: bumble bees, venerated since antiquity for their life-giving properties, and her fuzzy dog Bert, affectionately known as “The B.” Lori bee-lieves you can learn a lot from bees and dogs. Lori hopes the messages woven through her designs will touch, move and inspire all who come into contact with them, encouraging everyone to pause and slow down, too. To savor the small moments in each day and the beauty that is the core essence of each of us.